Safety is our number one concern. We fully appreciate the responsibility we have when a parent entrusts their child with us. The Camp's directors are parents of camp-aged children as well. So we spend a lot of time planning and preparing to keep everyone healthy and safe. 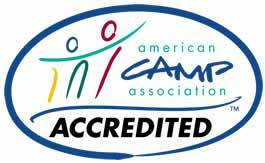 To meet health and safety expectations, the Camp is accredited by the American Camp Association, which is a parent's best evidence that a camp operates in a professional manner observing industry standards for safety. The American Camp Association has over 300 standards covering all aspects of a summer camp's operations, including staff selection, screening, training, and supervision; emergency preparation and communications; program design including staff to camper ratios and the requirement of various certifications such as first aid and life guarding; health care policies and procedures; food handling and preparation; transportation; and facilities maintenance. You can read more about camp accreditation here. And you can read more about the actual standards here. And you are more than welcome to call and speak to a director about any particular concerns you may have.